Enzymes were discovered by a German chemist called Eduard Buchner near the end of the nineteenth century. He discovered enzymes while trying to extract yeast fluid for medicinal use when he noticed that the sugar was continually being converted into alcohol. Even though Louis Pasteur had shown this about twenty years before Eduard Buchner, Louis Pasteur had said that it was the yeast itself that made the conversion. Eduard Buchner said that it was not the yeast but the ‘juice’ inside them. The word enzyme was used for the active ingredient in the yeast juice. Enzyme literally means ‘in yeast’ ( ‘en’ = in, ‘zyme’ = yeast) and all enzymes are used as organic catalysts to speed up chemical reactions in organisms. Without enzymes reactions in cells would be so slow that they would virtually not take place. Enzymes work very quickly and the speed action of an enzyme is said to be its ‘turnover number’. The turnover number is the number of substrate molecules which one molecule of the enzyme can turn into products per minute of a product 1. The turnover numbers of an enzyme can vary from 100 to many millions. For most enzymes the turnover number is several thousand. The speed of which some enzymes can work maybe shown by pepsin, for example 30g (1oz) of pure pepsin would be capable of digesting nearly 2 tonnes of egg white in a few hours 2. The fastest known enzyme is called ‘catalase’ and has a turnover number of 6 million. It is found in various tissues where it speeds up the decomposition of hydrogen peroxide (H2O2) and converts it into water and oxygen. The enzymes are not destroyed in their reactions and so can be used again and can work in either direction. 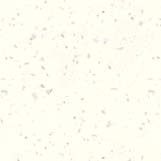 This means that large amounts of the product are formed. The enzyme is unchanged by the reaction it catalyses. · Enzymes are affected by heat. Up until about 40oC the rate increases smoothly at about double the rate of reaction for every ten degrees rise 1. Above this temperature the rate of reaction begins to decrease because at high temperatures the enzyme denatures. Due to this fact, very few cells can tolerate temperatures over 40oC – the optimum temperature. · The pH of an enzyme’s surroundings also affects its efficiency. Most enzymes function best around pH7 because excessive acidity or alkalinity makes them inactive. However, each enzyme has its own pH range, for example digestive enzymes prefer either acidic or alkaline surroundings. Generally, the more enzymes there are to catalyse a reaction, the quicker the reaction will proceed. This is because there is more chance of enzyme molecules randomly colliding and reacting with the substrate. The reverse is also true ; if you increase the concentration of substrate keeping the amount of enzyme fixed, then the rate of reaction will increase proportionately. This trend continues until there are more substrates than there are enzymes, (or vice-versa) when the reaction will be going at a maximum rate or speed. After this the rate ‘levels off’, and no matter how much more substrate you add, you won’t get any further rate increase. The aim of this investigation is to look at the effects of different concentrations of hydrogen peroxide on catalase enzyme (found in yeast) and the difference in the rates of reaction for the different reactions. I designed a pilot study to test my hypothesis. I predict that the higher the concentration of substrate (H2O2 ), the faster the rate of reaction will be with the catalase and I also predict that if you double the concentration of H2O2, you will double the initial rate of reaction. I expect this hypothesis to be true because at high concentrations of H2O2 there will be more substrate molecules present in the solution. This means that there will be more collisions per second between the catalase enzymes and the molecules of hydrogen peroxide substrate and as a result, the rate of reaction will increase 4. The rate of reaction increases because more collisions take place per minute in higher concentrations than at lower concentrations. Thus, more hydrogen peroxide is decomposed and more of the oxygen product is given off, so the rate of measurable reaction increases. Graph (a) shows that with excess substrate, the initial rate of reaction is directly proportional to the enzyme concentration so that if you double the concentration, the initial rate of reaction will also double (at constant temperature and pH). 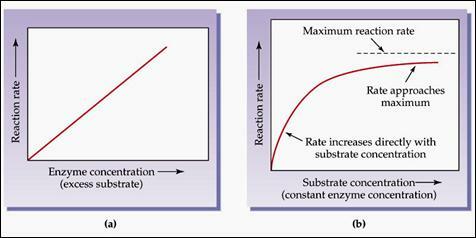 Graph (b) shows that with constant enzyme concentration and a relatively low substrate concentration, the overall rate of reaction is proportional to the substrate concentration (at constant temperature and pH) and that with increasing substrate concentration, the rate approaches a maximum. The same principle is used for enzyme concentration and will produce a similar graph. I predict that the actual results from my investigation will produce similar graphs for initial rate of reaction and enzyme concentration as shown in graph ‘b’ above. My independent variable will be the concentration of the H2O2 solution. H2O2 concentartion will be the only input variable because I will keep all the other variables constant. I shall use six different percentage concentrations of H2O2 solution at 1%, 2%, 4%, 6%, 8 % and 10%. I will use a 0% solution comprising water only for my control to adjust my results if any oxygen is given off from the hydrogen peroxide naturally decomposing. My source of enzyme (catalase) could be any living tissue as all cells contain this enzyme, but for ease of use I have decided to use a standard yeast solution. This will be the volume of oxygen produced from the reaction between the catalase and the hydrogen peroxide over 30 seconds. Later I can convert this figure to a volume per minute by doubling. 1. Temperature – As the temperature increases so does enzyme activity. However, this is only true up to around 40oC. Temperatures higher than 40oC will cause the enzymes to start to denature. By about 45oC the enzymes will have passed their ‘optimum’ and will have been denatured. The temperature must be kept constant otherwise the activity of the enzymes will fluctuate and so this will effect the volume of oxygen produced. I will use room temperature and make sure that all of my results are taken within the same hour. This will mean that the temperature should not noticeably fluctuate. 2. Volume of Hydrogen Peroxide – The volume of hydrogen peroxide must be the same for each experiment because if the volumes are different it will have an effect on the rate of reaction.. I will keep the volume of hydrogen peroxide at 1cm3. 3. Apparatus - I will try to keep the apparatus the same between each lesson – this will avoid any problems with different makes of glassware, stopwatches, measuring cylinders etc. which could introduce inaccuracy. 4. Start of Timing – I will start the stopwatch as I add the hydrogen peroxide to the catalase to ensure that all of the results will be in the same time frame. If the stopwatch is started before the hydrogen peroxide reaches the catalase then there will be a time of no reaction and so the rest of the results will be unreliable because their timing will be wrong. Similarly, if the stopwatch is started after the reaction has started to take place then, the results will be unreliable because they will correspond with the wrong time frame. 5. Concentration of the Catalase in Yeast Solution – In a high concentration of yeast there will be more catalase enzyme molecules than in a lower concentration of yeast. This means that more enzymes will be able to work at the same time to break down the hydrogen peroxide, and so reaction time will decrease as the enzyme concentration increases. Therefore, I will keep the concentration of the catalase in the initial yeast solution at 5% . 1. Collect and set up the apparatus as illustrated in the diagram above. Wear goggles when syringing. 2. Remove the bung from the test tube and place 1cm3 of 10% catalase (yeast) solution into the boiling tube using the syringe. 3. Fill the beaker with water. Place the end of the delivery tube into the water and make sure that the end of the delivery tube is completely submerged under the water. 4. Next, take the 10cm3 measuring test tube and fill it to the top with water. Place your thumb over the end of the measuring test tube so that no water will escape. Turn the tube upside down and place it over the end of the delivery tube. Make sure that the end of the measuring test tube is underwater before you take your thumb away otherwise the water will escape from the measuring tube. 5. Now take the other syringe and fill it with 1cm3 of 10% hydrogen peroxide. Collect the stopwatch. 6. Add the hydrogen peroxide and immediately replace the bung. Start the stopwatch as soon as the hydrogen peroxide is added. 7. Record the volume of oxygen produced by reading it off of the measuring test tube for one minute and collect at least three readings. The experiment must be repeated three times to make sure that you get accurate results. 8. Now repeat the experiment using 0% (water), 2%, 4%, 6% and 8% concentrations of H2O2. Dilute the H2O2 with water. For example, to make 8% concentration, dilute 0.8cm3 of H2O2 with 0.2cm3 of water. Repeat the above but with different volumes of water and H2O2 for the other solutions. These results show that my method should work. Most of the results are reasonably consistent. However, I can improve the reliability of my results by changing some of my method. · Instead of an instantaneous rate of reaction I shall record the complete reaction until there is no more change in the volume of oxygen produced. · I shall also take the recordings every 30 seconds so that the reaction may be followed more closely. · I shall also use more precise syringes which go up to 1 cm3 and so my results will be much more accurate. · I shall also make sure that no residue water or solution is left inside the boiling tube. · I shall use a syringe already inserted into the bung to add the hydrogen peroxide. This way no oxygen will escape because I will not have to replace the bung after adding the hydrogen peroxide. 1. Collect and set up the apparatus as illustrated in the diagram above. 2. Remove the bung from the test tube and place 1cm3 of catalase (yeast) solution into the boiling tube using the 1cm3 syringe. 3. Replace the bung and fill the beaker with water. Place the end of the delivery tube into the water and make sure that the end of the delivery tube is completely submerged in the water. 4. Next, take the 10cm3 measuring cylinder and fill it to the top with water. Place your thumb over the end of the measuring cylinder so that no water will escape. Turn the tube upside down and place it over the end of the delivery tube. Make sure that the end of the measuring test tube is underwater before you take your thumb away otherwise the water will escape from the measuring tube. 5. Now take the syringe out of the bung and fill it with 1cm3 of hydrogen peroxide. Make sure that the hydrogen peroxide is at 10% concentration. Collect the stopwatch. Add the hydrogen peroxide and at the same time start the stopwatch. 6. Record the volume of oxygen produced by reading it from the measuring test tube for every 30 seconds until the volume of oxygen remains constant for three consecutive readings. Repeat the experiment at least three times to make sure that you get accurate and reliable results. 7. Wash out the test tube twice to make sure that all of the previous reactants are gone. Then shake the test tube to remove all of the water. Wash out the syringe to ensure that the concentrations are not mixed. 8. Now repeat the experiment using 0% (water), 2%, 4%, 6%, 8% and 10% concentrations of H2O2. Dilute the H2O2 with water. For example, to make 8% concentration, dilute 0.8cm3 of H2O2 with 0.2cm3 of water. Repeat the above but with different volumes of water and H2O2 for the other solutions. 9. Make sure that each experiment is repeated three times to make the results reliable. 10. When repeating the experiment with diluted concentrations make that you gently swirl the test tube with the solution inside to make sure that you thoroughly dilute the H2O2. Make sure that goggles and laboratory coats are worn whenever syringing. Make sure that a damp cloth is nearby to mop up any spilt hydrogen peroxide. · 1 ´ Test tube rack. Now you have read this plan you need to carry out the practical. Your teacher will explain exactly how to go about this, but you can use the check-list below to keep a track of your progress. o Carry out the pilot method to familiarise yourself with the apparatus. o Carry out the main practical and record all results. o Draw up a ‘Perfect Table’ of results. o Construct a ‘Perfect Graph’ and Analyse the results in detail. o Evaluate the method – looking for errors and improvements.